1. Red (Life) – A book with a spirited protagonist totally proud of who they are. Someone who gives you LIFE! I’m going to choose two of my favorite characters that I’ve read about in 2018. I don’t think this will come as a surprise to anyone, but I’m choosing Leah Burke from Leah on the Offbeat by Becky Albertalli and Evelyn Hugo from The Seven Husbands of Evelyn Hugo by Taylor Jenkins Reid. Leah’s attitude reminded me so much of myself in high school. For better or for worse. I know that there wasn’t as much love for Leah on the Offbeat as there was for Simon vs. the Homo Sapiens Agenda and I get it. For me, I related to her so much and loved it more than Simon. I don’t think I need to go into a lot of detail about my love for Evelyn Hugo, I’ve already done that on multiple occasions, but she is proud of her heritage and proud of her sexuality even at a time when it wasn’t okay to be different. Since Chantel took Evelyn, I guess I’ll have to think outside of the box. Even though I could answer that book for every single one of these questions. 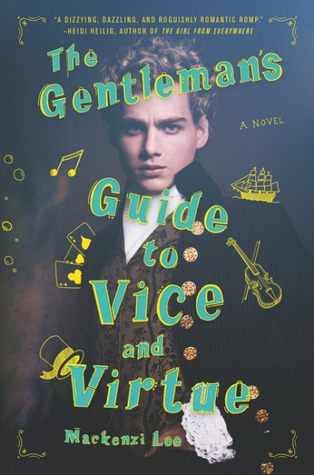 Now, I didn’t absolutely adore this book like everyone else (you can find my review here), I still think that all of the main characters in this book are spirited queer characters. You have Monty, a loud and proud bisexual. Felicity, an ace. Percy, definitely queer as hell. And they’re all great in their own way. 2. Orange (Healing) – A book that made you, as the reader, find a deeper meaning or catharsis in your own life. So, this question is super deep and I’m going to try not to get too personal, but How to Make a Wish by Ashley Herring Blake really caught me off guard with how much I related to it. It’s a beautiful book which features a really complicated mother/daughter relationship. That’s all I will say because it’s not an apples to apples comparison and my relationship with my mom is great now. However, it was definitely cathartic for me. So many tears. I think what I learned from this book was that hiding who you are is a dangerous thing. Not just for yourself, but also for others. When you pretend to be something you’re not, it hurts many people, more than just being yourself. 3. Yellow (Sunshine) – A book that fills you with so much joy it could brighten even your darkest day. I’m going to have to go with Of Fire and Stars by Audrey Coulthurst. This book was something I’ve wanted since I was young. It’s the story of two Princesses who fall in love. Growing up watching Disney movies, I saw plenty of Happily Ever Afters with the prince and princess. After figuring out that I was gay af, I longed to see two princesses have a happily ever after. I finally got it when I read this book and I love it. I cannot wait for the sequel to come out and I want to read it NOWWWWWWWWW. 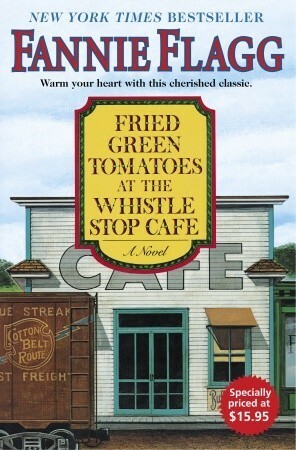 My choice has to be Fried Green Tomatoes at the Whistle Stop Cafe by Fannie Flagg. Not only is this a fantastic movie, but it’s a great book. Whenever I think about this book (and the movie tbh) I feel so happy and light inside. 4. Green (Nature) – A book that is set out of this world — a reality different to our own. I have to say that one of the best books I read last year was Not Your Sidekick by C.B. Lee. If I didn’t mention it in our end of year wrap up, shame on past me. SHAME. This book takes place in the near future where superheroes are a thing. It is a slight tweak in our world and yet it makes a huge difference. This book also has the most adorable f/f romance and I still think about it now. My one regret with this book is that I don’t have my own copy on my shelf. And that I haven’t read Not Your Villain. 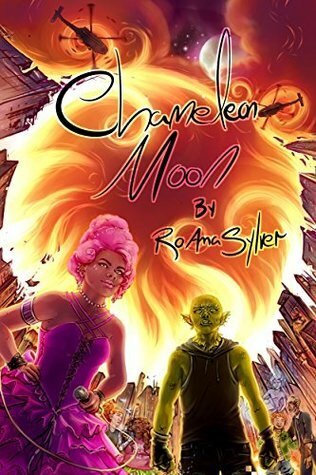 I can’t help but choose Chameleon Moon by RoAna Sylver! I’ve talked about this book many times on here, but it’s such a great queer book set in a fantastic world. There are great queer characters in this, too! 5. Blue (Peace) – A book where one of the characters finds peace with a difficult truth. I am going to talk about Fire Song by Adam Garnet Jones because I still don’t see a lot of people talking about this book despite its diversity of featuring Indigenous people. At the beginning of the book, Shane is dealing with the suicide of his younger sister and the way his mother isn’t dealing well with the grief. 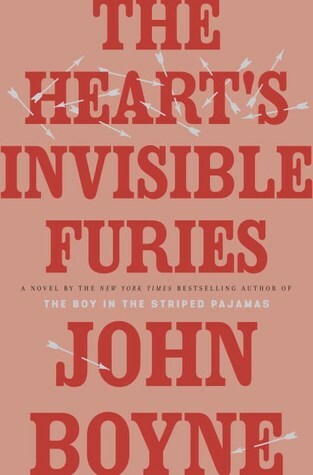 Throughout the book he longs to leave the reservation he lives on for Toronto but things aren’t going right. I think that by the end of the book, he’s at peace with his life and the possibility that things will get better for him. I don’t want to talk too much more about it because it can get spoilery, but Shane’s attitude, in the beginning, is completely different than at the end. 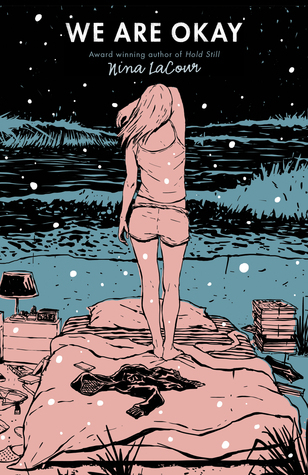 I’m going to choose We Are Okay by Nina LaCour for this. Because it’s definitely a book about coming to terms with what’s happened and what you’ve done, along with trying to find a way to be okay with it. It’s lovely and I know Chantel and I loved it. 6. Purple (Spirit) – A book that deals with LGBT+ themes and religion. Okay, I was tempted to put this book with the previous question, but I realize it fits better here. I’m talking about Release by Patrick Ness. Now, I love Patrick Ness (obviously) and I was so excited to read Release and I liked everything but the ghost stuff. One of the main plot points of the book is Adam’s family being religious (his father is a preacher) and him being closeted. The book takes place over one day and what I loved about it was that nothing gets wrapped up neatly in one day. The end of the book is just a start and Adam seems at peace with his situation. Even if it’s not perfect. This is a hard one for me. 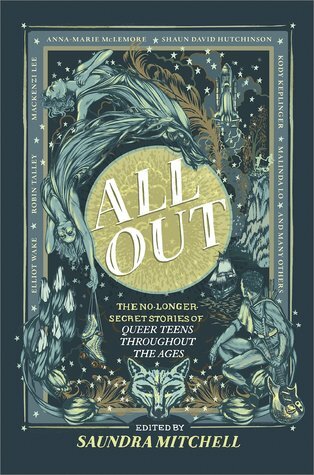 I really had to think before I came to choosing Three Witches from All Out: The No-Longer-Secret Stories of Queer Teens Throughout the Ages! The story takes place in 16th century Spain with an F/F romance. It was so great, one of my favorites from the collection. And, I highly suggest the book in general since it’s a terrifically diverse collection, just that Three Witches deals with religion specifically. As usual, we are not going to tag anyone. But! Don’t let that stop you! If you like this tag and want to do it, just say that we tagged you. What books would you recommend to us based on these categories? Ahhh, good!!! You’re welcome! Chantel has great queer book recs so if you’re looking for some, totally hit her up!